Today we interviewed a variety of people about the southwark lido and their thoughts on it. We first started off by interviewing Roger a co-owner of the land the lido is being built on, and his views and ideas about the project. Then we talked to Nicolas an architect who is involved in building the project, he has also done previous projects like this in different countries over the past five years. Then we did a joint interview with Pat a local resident of southwark who has lived in the area for thirty six years, with Abbeygail a youth worker who runs ‘se1united’ a project for youths. Also they recently got funded a hundred thousand pounds. We had to do a podcast of all their interviews and put it together as a short radio interview. This was very interesting to here all there different views from all different people living in the southwark borough. We interviewed some locals, and they really thought it was a positive thing for southwark to be holding an event like this as it would bring the community together. Today we interviewed and created our own radio broadcast. We spoke with the owner of the land and to Nicolas. We questioned various members of the general public including a youth worker and a resident. We edited and listened to the system. We know have a clear background of the project, Southwark and the values on the public. 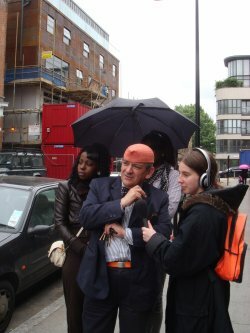 today we talked to a developer called roger and he gave a tour of southwark and a brief description of its history.we also went to the site and interviewed nicolas and he told us about the project. we also interviewed two women called abigail who is youth worker for a youth club called SE1 united and pat who is a local resident who has lived here for 36 years and was telling us how she feels and what she thinks about the area the whole time she has lived here. we are now editing the interviews that we did today and making it into a 5 mins recording for a pod cast on the web. today we came together and discussed and showed each other our most valuable objects, and also said a fact about southwark. We then watched a short episode of “City of Men” that showed Brazil in the last few years, in the slum areas. And some of the activities the kids go through on a day to day basis. we also visted the construction site after the second day of building and it is coming along very fast and should be done very soon. it’s showing great potential already and i’m very excited about what is to come. We took turns filming each other and the site. i found filming when a train goes past really difficult but it was so much fun. the cemetery (the Cross Bones Graveyard on Redcross Way) was inspiring – the way it was remembered by people who made it their history, even though there is no personal connection, and all the colourful ribbons were beautiful. one way that we could work round the noise of the train is that every time one goes past we make a freeze frame and make it part of the show.